For other people named Anastasia Romanova, see Anastasia Romanova (disambiguation). This name uses Eastern Slavic naming customs; the patronymic is Nikolaevna. Grand Duchess Anastasia Nikolaevna of Russia (Russian: Анастаси́я Никола́евна Рома́нова, tr. Anastasíya Nikoláyevna Románova; June 18 [O.S. June 5] 1901 – July 17, 1918) was the youngest daughter of Tsar Nicholas II, the last sovereign of Imperial Russia, and his wife, Tsarina Alexandra Feodorovna. 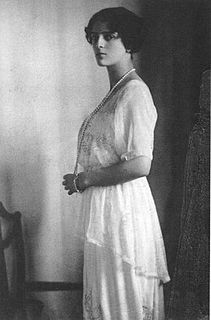 Anastasia was the younger sister of Grand Duchesses Olga, Tatiana, and Maria, and was the elder sister of Alexei Nikolaevich, Tsarevich of Russia. 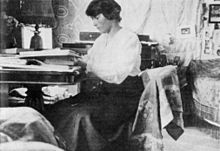 She was murdered with her family by a group of Bolsheviks in Yekaterinburg on July 17, 1918. Persistent rumors of her possible escape circulated after her death, fueled by the fact that the location of her burial was unknown during the decades of Communist rule. The abandoned mine serving as a mass grave near Yekaterinburg which held the acidified remains of the Tsar, his wife, and three of their daughters was revealed in 1991, and the bodies of Alexei Nikolaevich and the remaining daughter—either Anastasia or her older sister Maria—were discovered in 2007. These remains were later put to rest at Peter and Paul Fortress. Her possible survival has been conclusively disproved. Scientific analysis including DNA testing confirmed that the remains are those of the imperial family, showing that all four grand duchesses were killed in 1918. Several women falsely claimed to have been Anastasia; the best known impostor is Anna Anderson. Anderson's body was cremated upon her death in 1984, but DNA testing in 1994 on available pieces of Anderson's tissue and hair showed no relation to the Romanov family. When Anastasia was born, her parents and extended family were disappointed that she was a girl. They hoped for a son who would be heir apparent to the throne. Tsar Nicholas II went for a long walk to compose himself before going to visit Tsarina Alexandra and the newborn Anastasia for the first time. The fourth grand duchess was named for the fourth-century martyr St. Anastasia, known as "the breaker of chains" because, in honor of her birth, her father pardoned and reinstated students who had been imprisoned for participating in riots in St. Petersburg and Moscow the previous winter. "Anastasia" is a Greek name (Αναστασία), meaning "of the resurrection", a fact often alluded to later in stories about her rumored survival. Anastasia's title is most precisely translated as "Grand Princess". "Grand Duchess" became the most widely used translation of the title into English from Russian. The Tsar's children were raised as simply as possible. They slept on hard camp cots without pillows, except when they were ill, took cold baths in the morning, and were expected to tidy their rooms and do needlework to be sold at various charity events when they were not otherwise occupied. Most in the household, including the servants, generally called the Grand Duchess by her first name and patronym, Anastasia Nikolaevna, and did not use her title or style. She was occasionally called by the French version of her name, "Anastasie", or by the Russian nicknames "Nastya", "Nastas", or "Nastenka". Other family nicknames for Anastasia were "Malenkaya", meaning "little (one)" in Russian, or "schwipsig", meaning "merry little one" or "little mischief" in German. Young Anastasia was a vivacious and energetic child, described as short and inclined to be chubby, with blue eyes and strawberry-blonde hair. 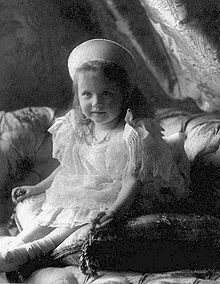 Margaretta Eagar, a governess to the four grand duchesses, said one person commented that the toddler Anastasia had the greatest personal charm of any child she had ever seen. While often described as gifted and bright, she was never interested in the restrictions of the school room, according to her tutors Pierre Gilliard and Sydney Gibbes. Gibbes, Gilliard, and ladies-in-waiting Lili Dehn and Anna Vyrubova described Anastasia as lively, mischievous, and a gifted actress. Her sharp, witty remarks sometimes hit sensitive spots. Anastasia's daring occasionally exceeded the limits of acceptable behavior. "She undoubtedly held the record for punishable deeds in her family, for in naughtiness she was a true genius", said Gleb Botkin, son of the court physician Yevgeny Botkin, who later died with the family at Yekaterinburg. Anastasia sometimes tripped the servants and played pranks on her tutors. As a child, she would climb trees and refuse to come down. Once, during a snowball fight at the family's Polish estate, Anastasia rolled a rock into a snowball and threw it at her older sister Tatiana, knocking her to the ground. 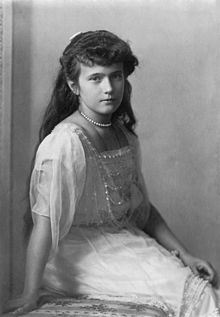 A distant cousin, Princess Nina Georgievna, recalled that "Anastasia was nasty to the point of being evil", and would cheat, kick and scratch her playmates during games; she was affronted because the younger Nina was taller than she was. She was less concerned about her appearance than her sisters. Hallie Erminie Rives, a best-selling American author and wife of an American diplomat, described how 10-year-old Anastasia ate chocolates without bothering to remove her long, white opera gloves at the St. Petersburg opera house. Anastasia and her older sister Maria were known within the family as "The Little Pair". The two girls shared a room, often wore variations of the same dress, and spent much of their time together. 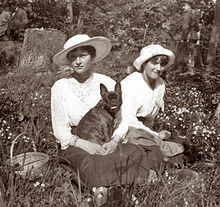 Their older sisters Olga and Tatiana also shared a room and were known as "The Big Pair". The four girls sometimes signed letters using the nickname OTMA, which was derived from the first letters of their first names. Despite her energy, Anastasia's physical health was sometimes poor. The Grand Duchess suffered from painful bunions, which affected both of her big toes. Anastasia had a weak muscle in her back and was prescribed twice-weekly massage. She hid under the bed or in a cupboard to put off the massage. 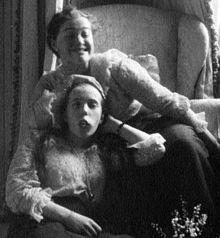 Anastasia's older sister, Maria, reportedly hemorrhaged in December 1914 during an operation to remove her tonsils, according to her paternal aunt Grand Duchess Olga Alexandrovna of Russia, who was interviewed later in her life. The doctor performing the operation was so unnerved that he had to be ordered to continue by Maria's mother. Olga Alexandrovna said she believed all four of her nieces bled more than was normal and believed they were carriers of the hemophilia gene, like their mother. Symptomatic carriers of the gene, while not hemophiliacs themselves, can have symptoms of hemophilia including a lower than normal blood clotting factor that can lead to heavy bleeding. 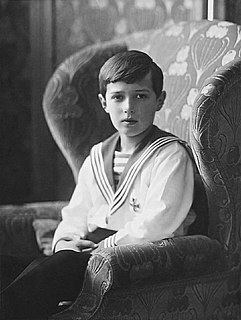 DNA testing on the remains of the royal family proved conclusively in 2009 that Alexei suffered from Hemophilia B, a rarer form of the disease. His mother and one sister, identified alternatively as Maria or Anastasia, were carriers. Therefore, had Anastasia lived to have children of her own, they might have been afflicted by the disease as well. Alexei's hemophilia was chronic and incurable; his frequent attacks caused permanent disability. Her mother relied on the counsel of Grigori Rasputin, a Russian peasant and wandering starets or "holy man," and credited his prayers with saving the ailing Tsarevich on numerous occasions. Anastasia and her siblings were taught to view Rasputin as "Our Friend" and to share confidences with him. In the autumn of 1907, Anastasia's aunt Grand Duchess Olga Alexandrovna of Russia was escorted to the nursery by the Tsar to meet Rasputin. 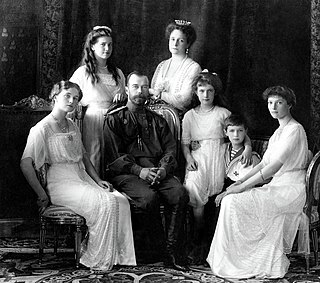 Anastasia, her sisters and brother Alexei were all wearing their long white nightgowns. "All the children seemed to like him," Olga Alexandrovna recalled. "They were completely at ease with him." Rasputin's friendship with the imperial children was evident in some of the messages he sent to them. In February 1909, Rasputin sent the imperial children a telegram, advising them to "Love the whole of God's nature, the whole of His creation in particular this earth. The Mother of God was always occupied with flowers and needlework." However, one of the girls' governesses, Sofia Ivanovna Tyutcheva, was horrified in 1910 that Rasputin was permitted access to the nursery when the four girls were in their nightgowns and wanted him barred. Nicholas asked Rasputin to avoid going to the nurseries in the future. The children were aware of the tension and feared that their mother would be angered by Tyutcheva's actions. "I am so afr(aid) that S.I. (governess Sofia Ivanovna Tyutcheva) can speak ... about our friend something bad," Anastasia's twelve-year-old sister Tatiana wrote to their mother on March 8, 1910. "I hope our nurse will be nice to our friend now." Tyutcheva was eventually fired. She took her story to other members of the family. While Rasputin's visits to the children were, by all accounts, completely innocent in nature, the family was scandalized. Tyutcheva told Nicholas's sister, Grand Duchess Xenia Alexandrovna of Russia, that Rasputin visited the girls, talked with them while they were getting ready for bed, and hugged and patted them. Tyutcheva said the children had been taught not to discuss Rasputin with her and were careful to hide his visits from the nursery staff. Xenia wrote on March 15, 1910, that she couldn't understand "...the attitude of Alix and the children to that sinister Grigory (whom they consider to be almost a saint, when in fact he's only a khlyst!)" In the spring of 1910, Maria Ivanovna Vishnyakova, a royal governess, claimed that Rasputin had raped her. Vishnyakova said the empress refused to believe her account of the assault, and insisted that "everything Rasputin does is holy." Grand Duchess Olga Alexandrovna was told that Vishnyakova's claim had been immediately investigated, but instead "they caught the young woman in bed with a Cossack of the Imperial Guard." Vishnyakova was kept from seeing Rasputin after she made her accusation and was eventually dismissed from her post in 1913. However, rumors persisted and it was later whispered in society that Rasputin had seduced not only the Tsarina but also the four grand duchesses. The gossip was fueled by ardent, yet by all accounts innocent, letters written to Rasputin by the Tsarina and the four grand duchesses which were released by Rasputin and which circulated throughout society. "My dear, precious, only friend," wrote Anastasia. "How much I should like to see you again. You appeared to me today in a dream. I am always asking Mama when you will come ... I think of you always, my dear, because you are so good to me ..."
This was followed by circulation of pornographic cartoons, which depicted Rasputin having relations with the Empress, her four daughters and Anna Vyrubova. After the scandal, Nicholas ordered Rasputin to leave St. Petersburg for a time, much to Alexandra's displeasure, and Rasputin went on a pilgrimage to Palestine. Despite the rumors, the imperial family's association with Rasputin continued until his murder on December 17, 1916. 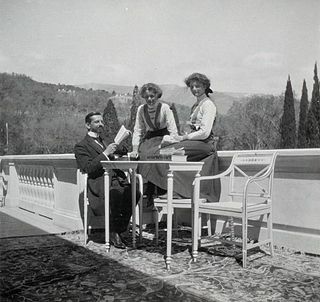 "Our Friend is so contented with our girlies, says they have gone through heavy 'courses' for their age and their souls have much developed", Alexandra wrote to Nicholas on December 6, 1916. In his memoirs, A. A. Mordvinov reported that the four grand duchesses appeared "cold and visibly terribly upset" by Rasputin's death, and sat "huddled up closely together" on a sofa in one of their bedrooms on the night they received the news. Mordvinov recalled that the young women were in a gloomy mood and seemed to sense the political upheaval that was about to be unleashed. Rasputin was buried with an icon signed on its reverse by Anastasia, her mother and her sisters. She attended his funeral on December 21, 1916, and her family planned to build a church over the site of Rasputin's grave. After they were killed by the Bolsheviks, it was discovered Anastasia and her sisters were all wearing amulets bearing Rasputin's picture and a prayer. 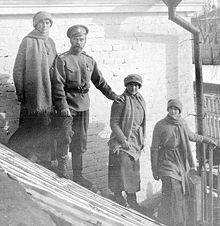 During World War I, Anastasia, along with her sister Maria, visited wounded soldiers at a private hospital in the grounds at Tsarskoye Selo. The two teenagers, too young to become Red Cross nurses like their mother and elder sisters, played games of checkers and billiards with the soldiers and tried to lift their spirits. Felix Dassel, who was treated at the hospital and knew Anastasia, recalled that the grand duchess had a "laugh like a squirrel", and walked rapidly "as though she tripped along." In February 1917, Anastasia and her family were placed under house arrest at the Alexander Palace in Tsarskoye Selo during the Russian Revolution. Nicholas II abdicated on March 2/15, 1917. As the Bolsheviks approached, Alexander Kerensky of the Provisional Government had them moved to Tobolsk, Siberia. After the Bolsheviks seized majority control of Russia, Anastasia and her family were moved to the Ipatiev House, or House of Special Purpose, at Yekaterinburg. "When she died she was only sixteen years old ... Ther(e) was a man who loved her without having seen her but (k)new her very well. And she he(a)rd of him also. He never could tell her that he loved her, and now she was dead. But still he thought that when he and she will live [their] next life whenever it will be that ...", she wrote. "The sailor Nagorny, who attended to Alexei Nikolaevitch, passed my window carrying the sick boy in his arms, behind him came the Grand Duchesses loaded with valises and small personal belongings. I tried to get out, but was roughly pushed back into the carriage by the sentry. I came back to the window. Tatiana Nikolayevna came last carrying her little dog and struggling to drag a heavy brown valise. It was raining and I saw her feet sink into the mud at every step. Nagorny tried to come to her assistance; he was roughly pushed back by one of the commisars ..."
"Once, standing on some steps at the door of a house close by, I saw a hand and a pink-sleeved arm opening the topmost pane. According to the blouse the hand must have belonged either to the Grand Duchess Marie or Anastasia. They could not see me through their windows, and this was to be the last glimpse that I was to have of any of them!" However, even in the last months of her life, she found ways to enjoy herself. She and other members of the household performed plays for the enjoyment of their parents and others in the spring of 1918. Anastasia's performance made everyone howl with laughter, according to her tutor Sydney Gibbes. "We played on the swing, that was when I roared with laughter, the fall was so wonderful! Indeed! I told the sisters about it so many times yesterday that they got quite fed up, but I could go on telling it masses of times ... What weather we've had! One could simply shout with joy." In his memoirs, one of the guards at the Ipatiev House, Alexander Strekotin, remembered Anastasia as "very friendly and full of fun", while another guard said Anastasia was "a very charming devil! She was mischievous and, I think, rarely tired. She was lively, and was fond of performing comic mimes with the dogs, as though they were performing in a circus." Yet another of the guards, however, called the youngest grand duchess "offensive and a terrorist" and complained that her occasionally provocative comments sometimes caused tension in the ranks. Anastasia and her sisters helped their maid darn stockings and assisted the cook in making bread and other kitchen chores while they were in captivity at the Ipatiev House. In the summer, the privations of the captivity, including their closer confinement at the Ipatiev House negatively affected the family. According to some accounts, at one point Anastasia became so upset about the locked, painted windows that she opened one to look outside and get fresh air. A sentry reportedly saw her and fired, narrowly missing her. She did not try again. On July 14, 1918, local priests at Yekaterinburg conducted a private church service for the family. They reported that Anastasia and her family, contrary to custom, fell on their knees during the prayer for the dead, and that the girls had become despondent and hopeless, and no longer sang the replies in the service. Noticing this dramatic change in their demeanor since his last visit, one priest told the other, "Something has happened to them in there." 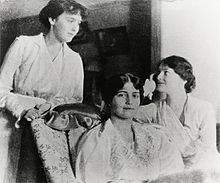 But the next day, on July 15, 1918, Anastasia and her sisters appeared in good spirits as they joked and helped move the beds in their shared bedroom so that cleaning women could clean the floors. They helped the women scrub the floors and whispered to them when the guards were not watching. Anastasia stuck her tongue out at Yakov Yurovsky, the head of the detachment, when he momentarily turned his back and left the room. After the Bolshevik revolution in October 1917, Russia quickly disintegrated into civil war. Negotiations for the release of the Romanovs between their Bolshevik (commonly referred to as 'Reds') captors and their extended family, many of whom were prominent members of the royal houses of Europe, stalled. As the Whites (anti-Bolshevik forces, although not necessarily supportive of the Tsar) advanced toward Yekaterinburg, the Reds were in a precarious situation. The Reds knew Yekaterinburg would fall to the better manned and equipped White Army. When the Whites reached Yekaterinburg, the imperial family had simply disappeared. The most widely accepted account was that the family had been murdered. This was due to an investigation by White Army investigator Nicholas Sokolov, who came to the conclusion based on items that had belonged to the family being found thrown down a mine shaft at Ganina Yama. The "Yurovsky Note", an account of the event filed by Yurovsky to his Bolshevik superiors following the killings, was found in 1989 and detailed in Edvard Radzinsky's 1992 book, The Last Tsar. According to the note, on the night of the deaths the family was awakened and told to dress. They were told they were being moved to a new location to ensure their safety in anticipation of the violence that might ensue when the White Army reached Yekaterinburg. Once dressed, the family and the small circle of servants who had remained with them were herded into a small room in the house's sub-basement and told to wait. Alexandra and Alexei sat in chairs provided by guards at the Empress's request. After several minutes, the guards entered the room, led by Yurovsky, who quickly informed the Tsar and his family that they were to be executed. The Tsar had time to say only "What?" and turn to his family before he was killed by several bullets to the chest (not, as is commonly stated, to the head; his skull, recovered in 1991, bears no bullet wounds). The Tsarina and her daughter Olga tried to make the sign of the cross, but were killed in the initial volley of bullets fired by the executioners. The rest of the Imperial retinue were shot in short order, with the exception of Anna Demidova, Alexandra's maid. Demidova survived the initial onslaught, but was quickly stabbed to death against the back wall of the basement, while trying to defend herself with a small pillow she had carried into the sub-basement that was filled with precious gems and jewels. The "Yurovsky Note" further reported that once the thick smoke that had filled the room from so many weapons being fired in such close proximity cleared, it was discovered that the executioners' bullets had ricocheted off the corsets of two or three of the Grand Duchesses. The executioners later came to find out that this was because the family's crown jewels and diamonds had been sewn inside the linings of the corsets to hide them from their captors. The corsets thus served as a form of "armor" against the bullets. Anastasia and Maria were said to have crouched up against a wall, covering their heads in terror, until they were shot down by bullets, recalled Yurovsky. However, another guard, Peter Ermakov, told his wife that Anastasia had been finished off with bayonets. As the bodies were carried out, one or more of the girls cried out, and were clubbed on the back of the head, wrote Yurovsky. Anastasia's supposed escape and possible survival was one of the most popular historical mysteries of the 20th century, provoking many books and films. At least ten women claimed to be her, offering varying stories as to how she had survived. Anna Anderson, the best known Anastasia impostor, first surfaced publicly between 1920 and 1922. She contended that she had feigned death among the bodies of her family and servants, and was able to make her escape with the help of a compassionate guard who noticed she was still breathing and took sympathy upon her. Her legal battle for recognition from 1938 to 1970 continued a lifelong controversy and was the longest running case ever heard by the German courts, where it was officially filed. The final decision of the court was that Anderson had not provided sufficient proof to claim the identity of the grand duchess. Anderson died in 1984 and her body was cremated. DNA tests were conducted in 1994 on a tissue sample from Anderson located in a hospital and the blood of Prince Philip, Duke of Edinburgh, a great-nephew of Empress Alexandra. According to Dr Gill who conducted the tests, "If you accept that these samples came from Anna Anderson, then Anna Anderson could not be related to Tsar Nicholas or Tsarina Alexandra." Anderson's mitochondrial DNA was a match with a great-nephew of Franziska Schanzkowska, a missing Polish factory worker. Some supporters of Anderson's claim acknowledged that the DNA tests proving she could not have been the Grand Duchess had "won the day". Other lesser known claimants were Nadezhda Ivanovna Vasilyeva and Eugenia Smith. Two young women claiming to be Anastasia and her sister Maria were taken in by a priest in the Ural Mountains in 1919 where they lived as nuns until their deaths in 1964. They were buried under the names Anastasia and Maria Nikolaevna. Rumors of Anastasia's survival were embellished with various contemporary reports of trains and houses being searched for "Anastasia Romanov" by Bolshevik soldiers and secret police. 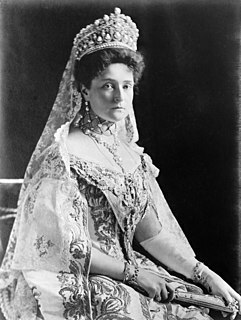 When she was briefly imprisoned at Perm in 1918, Princess Helena Petrovna, the wife of Anastasia's distant cousin, Prince John Constantinovich of Russia, reported that a guard brought a girl who called herself Anastasia Romanova to her cell and asked if the girl was the daughter of the Tsar. Helena Petrovna said she did not recognize the girl and the guard took her away. Although other witnesses in Perm later reported that they saw Anastasia, her mother and sisters in Perm after the murders, this story is now widely discredited. Rumors that they were alive were fueled by deliberate misinformation designed to hide the fact that the family was dead. A few days after they had been murdered, the German government sent several telegrams to Russia demanding "the safety of the princesses of German blood". Russia had recently signed a peace treaty with the Germans, and did not want to upset them by letting them know the women were dead, so they told them they had been moved to a safer location. In another incident, eight witnesses reported the recapture of a young woman after an apparent escape attempt in September 1918 at a railway station at Siding 37, northwest of Perm. These witnesses were Maxim Grigoyev, Tatiana Sitnikova (and her son Fyodor Sitnikov), Ivan Kuklin and Matrina Kuklina, Vassily Ryabov, Ustinya Varankina, and Dr Pavel Utkin, a physician who treated the girl after the incident. Some of the witnesses identified the girl as Anastasia when they were shown photographs of the grand duchess by White Russian Army investigators. Utkin also told the White Russian Army investigators that the injured girl, whom he treated at Cheka headquarters in Perm, told him, "I am the daughter of the ruler, Anastasia." Utkin obtained a prescription from a pharmacy for a patient named "N" at the orders of the secret police. White Army investigators later independently located records for the prescription. During the same time period in mid-1918, there were several reports of young people in Russia passing themselves off as Romanov escapees. Boris Soloviev, the husband of Rasputin's daughter Maria, defrauded prominent Russian families by asking for money for a Romanov impostor to escape to China. Soloviev also found young women willing to masquerade as one of the grand duchesses to assist in deceiving the families he had defrauded. Some biographers' accounts speculated that the opportunity for one or more of the guards to rescue a survivor existed. Yakov Yurovsky demanded that the guards come to his office and turn over items they had stolen following the murder. There was reportedly a span of time when the bodies of the victims were left largely unattended in the truck, in the basement and in the corridor of the house. Some guards who had not participated in the murders and had been sympathetic to the grand duchesses were reportedly left in the basement with the bodies. In 1991, the presumed burial site of the imperial family and their servants was excavated in the woods outside Yekaterinburg. The grave had been found nearly a decade earlier, but was kept hidden by its discoverers from the Communists who were still ruling Russia at the time. The grave only held nine of the expected eleven sets of remains. DNA and skeletal analysis matched these remains to Tsar Nicholas II, Tsarina Alexandra, and three of the four grand duchesses (Olga, Tatiana and presumably Maria). The other remains, with unrelated DNA, correspond to the family's doctor (Yevgeny Botkin), their valet (Alexei Trupp), their cook (Ivan Kharitonov), and Alexandra's maid (Anna Demidova). 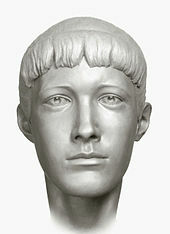 Forensic expert William R. Maples decided that the Tsarevitch Alexei and Anastasia's bodies were missing from the family's grave. Russian scientists contested this conclusion, however, claiming it was the body of Maria that was missing. The Russians identified the body as that of Anastasia by using a computer program to compare photos of the youngest grand duchess with the skulls of the victims from the mass grave. They estimated the height and width of the skulls where pieces of bone were missing. American scientists found this method inexact. American scientists thought the missing body to be Anastasia because none of the female skeletons showed the evidence of immaturity, such as an immature collarbone, undescended wisdom teeth, or immature vertebrae in the back, that they would have expected to find in a seventeen-year-old. In 1998, when the remains of the imperial family were finally interred, a body measuring approximately 5'7" (1.70 m) was buried under the name of Anastasia. Photographs taken of her standing beside her three sisters up until six months before the murders demonstrate that Anastasia was several inches shorter than all of them. Grand Duchess Anastasia Nikolaevna of Russia aboard the Rus, the ship that ferried her to Yekaterinburg in May 1918. 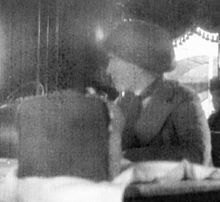 This is the last known photograph of Anastasia. The account of the "Yurovsky Note" indicated that two of the bodies were removed from the main grave and cremated at an undisclosed area in order to further disguise the burials of the Tsar and his retinue, if the remains were discovered by the Whites, since the body count would not be correct. Searches of the area in subsequent years failed to turn up a cremation site or the remains of the two missing Romanov children. However, on August 23, 2007, a Russian archaeologist announced the discovery of two burned, partial skeletons at a bonfire site near Yekaterinburg that appeared to match the site described in Yurovsky's memoirs. The archaeologists said the bones were from a boy who was roughly between the ages of ten and thirteen years at the time of his death and of a young woman who was roughly between the ages of eighteen and twenty-three years old. Anastasia was seventeen years and one month old at the time of the assassination, while her sister Maria was nineteen years, one month old and her brother Alexei was two weeks shy of his fourteenth birthday. Anastasia's elder sisters Olga and Tatiana were twenty-two and twenty-one years old respectively at the time of the assassination. Along with the remains of the two bodies, archaeologists found "shards of a container of sulfuric acid, nails, metal strips from a wooden box, and bullets of various caliber". The site was initially found with metal detectors and by using metal rods as probes. […] a well publicized debate over which daughter, Maria (according to Russian experts) or Anastasia (according to US experts), has been recovered from the second grave cannot be settled based upon the DNA results reported here. In the absence of a DNA reference from each sister, we can only conclusively identify Alexei – the only son of Nicholas and Alexandra. In 2000, Anastasia and her family were canonized as passion bearers by the Russian Orthodox Church. 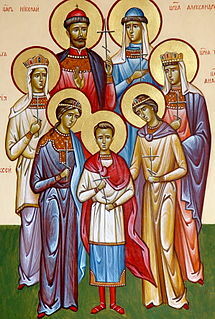 The family had previously been canonized in 1981 by the Russian Orthodox Church Abroad as holy martyrs. The bodies of Tsar Nicholas II, Tsarina Alexandra, and three of their daughters were finally interred in the St. Catherine Chapel at Saints Peter and Paul Cathedral, St Petersburg on July 17, 1998, eighty years after they were murdered. The purported survival of Anastasia has been the subject of cinema, made-for-television films, and a Broadway musical. The earliest, made in 1928, was called Clothes Make the Woman. The story followed a woman who turns up to play the part of a rescued Anastasia for a Hollywood film, and ends up being recognized by the Russian soldier who originally rescued her from her would-be assassins. ^ "DNA Confirms Remains Of Czar's Children". CBS News. February 11, 2009. Retrieved September 8, 2011. ^ Coble, Michael D.; Loreille, Odile M.; Wadhams, Mark J.; Edson, Suni M.; Maynard, Kerry; Meyer, Carna E.; Niederstätter, Harald; Berger, Cordula; Berger, Burkhard; Falsetti, Anthony B.; Gill, Peter; Parson, Walther; Finelli, Louis N.; Hofreiter, Michael (2009). "Mystery Solved: The Identification of the Two Missing Romanov Children Using DNA Analysis". PLOS One. 4 (3): e4838. doi:10.1371/journal.pone.0004838. PMC 2652717. PMID 19277206. ^ a b Eagar, Margaret (1906). "Six Years at the Russian Court". alexanderpalace.org. Retrieved December 11, 2006. ^ a b c Vyrubova, Anna. "Memories of the Russian Court". alexanderpalace.org. Retrieved December 13, 2006. ^ Gilliard, Pierre. "Thirteen Years at the Russian Court". alexanderpalace.org. Retrieved December 13, 2006. ^ Dehn, Lilli (1922). "The Real Tsaritsa". alexanderpalace.org. Retrieved December 13, 2006. ^ Price, Michael (2009). "Case Closed: Famous Royals Suffered from Hemophilia". Science. Retrieved March 26, 2016. ^ Moss, Vladimir (2005). "The Mystery of Redemption". St. Michael's Press; retrieved February 21, 2007. ^ Sams, Ed. "Victoria's Dark Secrets". alexanderpalace.org. Archived from the original on January 7, 2007. Retrieved December 31, 2006. ^ "Left Behind – Chapter VII – Journey to Ekaterinburg". Alexanderpalace.org. Retrieved May 5, 2009. ^ Anastasia Dead or Alive? Michael Barnes (screenwriter) & Michael Barnes (director) & Paula S. Apsell (executive producer) & Michael Barnes (producer) & Julia Cort & Julian Nott (co-producers). Nova. October 10, 1995. Season 23 Ep. 1. ^ Alexeev, V. V., "Last Act of a Tragedy", documents from German government files discovered by Sokolov. ^ Gutterman, Steve (August 24, 2007). "Remains of tzar's heir may have been found". The Guardian. London, UK. Retrieved August 24, 2007. ^ Rogaev, Evgeny I.; Grigorenko, Anastasia P.; Moliaka, Yuri K.; Faskhutdinova, Gulnaz; Goltsov, Andrey; Lahti, Arlene; Hildebrandt, Curtis; Kittler, Ellen L.W. ; Morozova, Irina (March 31, 2009) [published online before print February 27, 2009]. "Genomic identification in the historical case of the Nicholas II royal family". Proceedings of the National Academy of Sciences. 106 (13): 5258–63. doi:10.1073/pnas.0811190106. PMC 2664067. PMID 19251637. ^ Shevchenko, Maxim (2000). "The Glorification of the Royal Family". Nezavisimaya Gazeta. Archived from the original on August 24, 2005. Retrieved December 10, 2006. ^ a b Gelardi, Julia P. (April 1, 2007). Born to Rule: Five Reigning Consorts, Granddaughters of Queen Victoria. St. Martin's Press. p. 10. ISBN 9781429904551. Retrieved July 15, 2018. ^ a b c d "Christian IX". The Danish Monarchy. Archived from the original on April 3, 2005. Retrieved July 14, 2018. ^ a b Willis, Daniel A. (2002). The Descendants of King George I of Great Britain. Clearfield Company. p. 717. ISBN 978-0-8063-5172-8. ^ a b c d e f Louda, Jiří; Maclagan, Michael (1999). Lines of Succession: Heraldry of the Royal Families of Europe. London: Little, Brown. p. 34. ISBN 978-1-85605-469-0. ^ a b c d Zeepvat, Charlotte. Heiligenberg: Our Ardently Loved Hill. Published in Royalty Digest. No 49. July 1995. 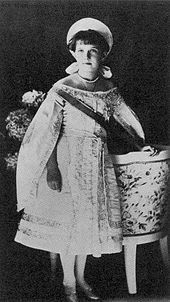 Wikimedia Commons has media related to Anastasia Nikolaevna of Russia. Anna Anderson was the best known of several impostors who claimed to be Grand Duchess Anastasia of Russia. 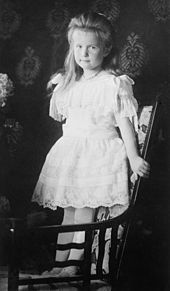 Anastasia, the youngest daughter of the last Tsar and Tsarina of Russia, Nicholas II and Alexandra, was killed along with her parents and siblings on 17 July 1918 by communist revolutionaries in Yekaterinburg, Russia, but the location of her body was unknown until 2007. Princess Catherine Dolgorukova, also known as Catherine Dolgorukova, Dolgoruki, or Dolgorukaya, was the daughter of Prince Michael Dolgorukov and Vera Vishnevskaya. She was a long-time mistress of Tsar Alexander II of Russia and later, as his morganatic wife, was given the title of Princess Yurievskaya. Grand Duchess Alexandra Alexandrovna of Russia was the eldest child and first daughter of Tsar Alexander II of Russia and his first wife Marie of Hesse and by Rhine. She died from infant meningitis at the age of six and a half. Princess Irene of Hesse and by Rhine was the third child and third daughter of Princess Alice of the United Kingdom and Louis IV, Grand Duke of Hesse and by Rhine. Her maternal grandparents were Queen Victoria and Prince Albert of Saxe-Coburg and Gotha. Her paternal grandparents were Prince Charles of Hesse and by Rhine and Princess Elizabeth of Prussia. She was the wife of Prince Henry of Prussia, a younger brother of Wilhelm II, German Emperor and her first cousin. The SS Prinzessin Irene, a liner of the North German Lloyd was named after her. Princess Helen of Serbia and Yugoslavia was the daughter of King Peter I of Yugoslavia and his wife Princess Zorka of Montenegro. She was the elder sister of George, Crown Prince of Serbia and King Alexander I of Yugoslavia. Helen was also a niece of Anastasia of Montenegro, wife of Grand Duke Nicholas Nikolaevich of Russia, and of Milica of Montenegro, wife of Grand Duke Peter Nicolaievich of Russia, the women who introduced Grigori Rasputin to Tsarina Alexandra. Pierre Gilliard was a Swiss academic and author, best known as the French language tutor to the five children of Emperor Nicholas II of Russia from 1905 to 1918. In 1921, after the Russian Revolution of 1917, he published a memoir, Thirteen Years at the Russian Court, about his time with the family. In his memoirs, Gilliard described Tsarina Alexandra's torment over her son's haemophilia and her faith in the ability of starets Grigori Rasputin to heal the boy. The members of the Russian imperial family, the House of Romanov, were executed by firing squad by the Bolsheviks in Yekaterinburg, Russia, on July 17, 1918, during both the Russian Civil War and near the end of the First World War. Grand Duchess Olga Nikolaevna of Russia was the eldest daughter of the last Tsar of the Russian Empire, Emperor Nicholas II, and of Empress Alexandra of Russia.